Image caption Police said Rachel Swettenham "brazenly abused her position of trust"
A legal clerk who siphoned more than £300,000 from her employers has been jailed for four years. Rachel Swettenham, from Deganwy, Conwy, admitted stealing the money, which she used to put deposits down on houses and to buy cars and a boat. 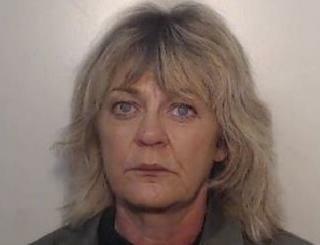 Police said the 54-year-old "brazenly abused her position of trust" at the Stockport solicitors where she had worked for more than 30 years. The fraud came to light during a review of her employment and conduct. Swettenham directly transferred funds from 24 clients to her personal bank account, to her husband's account and to other clients between 2012 and 2014, Manchester's Minshull Street Crown Court heard. The law firm, Gorvins, has refunded all of the money stolen from clients. Her husband Roger Swettenham, 55, of Penlan, Llandudno, Conwy, pleaded guilty at an earlier hearing to possession of criminal property. He was sentenced to 12 months in prison, suspended for two years, and ordered to carry out 200 hours of unpaid work. Det Con Katherine Perry, from Greater Manchester Police, described Swettenham's behaviour as "repugnant", and said: "She paid no heed to how these losses would affect her clients or her employer." Swettenham, of Sefton Terrace, admitted fraud by abuse of position at an earlier hearing.